Rudy pulled on his black hoodie and rolled the ski mask up on his head so it would pass as a beanie. He opened it up his bag again to triple-check the contents. Satisfied, he set out into the night. As he pulled up to the foot of the estate, Rudy turned off the headlights and drove the last few yards in the dark. He parked the battered ‘88 Civic and surveyed the scene. The DeMarino estate loomed ahead, an edifice to wealth that sat oppressively close to the blue-collar county Rudy lived in. The mansion sat alone, nestled in the hills, its private space carved out by the leagues of ornate, wrought-iron fencing that surrounded the entire perimeter of the land. Rudy threw his bag over the fence, then pulled himself up and over. He landed with a soft thud, and then waited motionlessly to see if there was any indication that he had been heard. The woods were quiet. As Rudy gathered his bag, he wondered why no one had ever robbed the DeMarino sisters before. They were obviously wealthier than anyone else around, and they were only a short drive away from the town. They lived alone, and it was rumored that they only ever hired women to staff the estate. “Easy prey,” Rudy said to no one as he rolled the ski mask down over his face. The estate seemed much larger than Rudy had imagined as he stalked through the dark trees. He took his time, careful to navigate without a flashlight, trying his best to move as quietly as he could. All he needed was to get close to the manor and he would be in the clear. Finally, Rudy broke into a sprint as the trees gave way to a well-tended garden. He ran towards the rear of the house and crouched in the hedges next to the back door. He took a second to admire the lap pool, then unzipped his backpack, grabbing a handful of cloth inside. 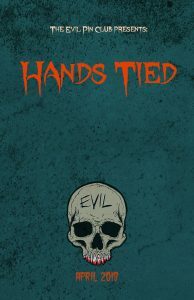 He removed the ribbons of cloth, revealing a shrivelled up pair of human hands bound together with baker’s twine. The hands and twine were coated in a thick layer of greenish-grey wax, and wicks had been placed on the fingers to make a grisly candelabra. Rudy smiled at his handiwork. He had found the recipe for the Hand of Glory at an old estate sale in a book of witchcraft and demonology strangely titled “Petite Albert.” Who Albert was, or what made him petite was never stated, but after reading the book, Rudy suddenly found himself interested in the occult. The book claimed that by turning the pickled hand of a murderer into a candle, the Hand of Glory would give the holder the power to unlock any door and freeze people in place. Rudy he knew the perfect use for such a tool. Rudy flicked on his lighter and lit the wicks on the hand. As the makeshift candle started the burn, the wind began to howl. As Rudy was about to shield the candle from the gust, the wind died and the flame turned a bluish green. “Wow.” Rudy started at the supernatural flicker of the green light. “I’ll take that as a sign it works.” Rudy sprang to action. He turned to the door and as he grabbed the knob he could feel the lock slide back into the door. He smiled and entered. Rudy found himself in a long hallway. The house was dark, but the light of the hand of glory slithered over everything as if it was a living thing. Rudy found his way to the main staircase. He ascended quickly, his eyes darting around looking for valuables to plunder. Rudy stopped. He realized he had almost run directly into a maid – the young girl was holding a duster, and she was frozen in the middle of cleaning a bronze bust. Her eyes were wide with surprise, and they followed Rudy’s hand as he waved it in front of her face. He smiled and pushed past the magically-immobilized girl, in search of a better pay day. Going room to room, Rudy began to get frustrated. The large television was too big to carry by himself, and the expensive-looking decorations were too unique to fence. He skulked through the estate with little luck. He found his way back to the main staircase and headed up to the third floor. After a few doors, Rudy came across a study where he saw the three DeMarino sisters. He recognized them from the newspaper feature on them when they had a rare public appearance at the opening of the girl’s orphanage in the city. He didn’t remember their names, but the younger two were seated in large leather chairs that dwarfed the small women’s frames. The oldest sister, who still looked surprising young despite the grey streaks in her hair, sat behind a desk, her hands folded neatly on a stack of papers. In the corner of the room, a large safe lay open, bars of gold and stacks of cash stacked inside, naked for the world to see. His attention on the safe, Rudy didn’t notice the black slime smeared around the frame of the door. Rudy strolled in and waved jovilly at the women, who simply watched him from their chairs. Rudy set the hand of glory on a shelf in the safe, unzipped his bag, and began to stuff handfuls of gold and money into it. Rudy felt someone behind him. A letter opener pierced his shoulder. Rudy dropped a bar of gold and screamed. He spun around and the oldest sister stood before him. Rudy swung at her, but the woman easily caught his wrist. “What’s going on? I thought you were frozen?” Rudy gritted his teeth as he struggled against her inhuman strength – he tried to pull away but her grip was like a vice. Agnes DeMarino let out a sigh. “Silly man. You shouldn’t have come here. Did you really think we wouldn’t know how to cancel the hand’s power?” The woman picked up the hand of glory. “Although I am surprised as your thoughtfulness. You didn’t know which hand the murderer had used, so you took both of them to be sure.” Rudy fell to his knees, his arm still held by Agnes. “You were smart enough to take both hands, but you were dumb enough to try to steal from us.” The eldest sister’s nails began to dig into Rudy’s arm. He screamed as his sleeve became wet with blood. The third sister with the short hair leaned in.. Rudy saw her eyes blink once, then turn into black voids. “You should have also noticed all the black oil smeared around the door of the room.” Rudy gasped as her skin began to wrinkle and yellow. “Point taken, Mary.” Sarah leaned her distorted, wrinkled face in even closer to Rudy. He breath smelled like death. “But really, even if he didn’t read that a simple potion smeared across the doorway could negate the power of the hand, the safe being left wide open should have just screamed ‘trap’.” Mary handed Sarah the knife. Rudy screamed as the kris was jammed through his foot, pinning it to the floor. He thrashed violently, but still Agnes’ grip held fast. The long-haired sister, now also turned a crone, took a spined nail and hammer and in one blow nailed Rudy’s hand to the floorboard. Through Rudy’s screaming, she raised her hammer and ran another nail through. When Rudy awoke, pain filled his consciousness. He realized he was naked, laying spread-eagle on a stone tablet in a long black room with candles lining the walls. As his vision came into focus, he realized there were young girls all around him. They all wore black robes. Some looked as young as six. Rudy tried to move, but found that his body was completely immobilized. His eyes darted around, and he recognized the face of the maid he had seen earlier. He also recognized the hand of glory that she was now holding and using against him. The DeMarino sisters walked into view. Agnes wore a flowing robe the color of night. As she approached, Rudy saw she held a scalpel. The girl holding the hand of glory raised her hand. Mary nodded at her. At a sign from Sarah, the girls began to chant in some ancient tongue. As Agnes began to cut, Rudy tried to scream, but found his tongue was locked in place by the hand of glory. -Tony P, Chris M-P, Derek S, Melissa S-O – you’re the best! You made this happen!